MobiCushion Pneumatic Seat Cushions are portable seat cushion systems that are perfect for use on wheelchairs, seats and other sitting surfaces. 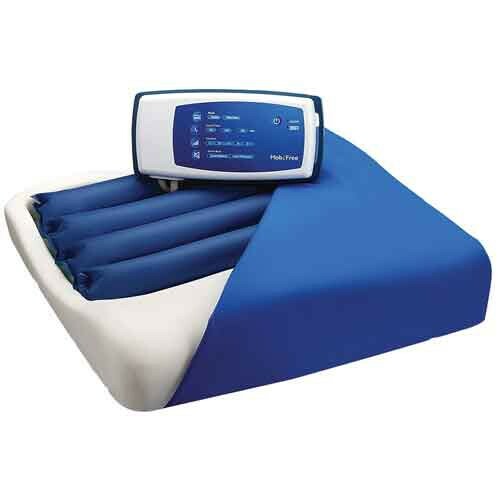 While specifically made for portable devices, the cushion is fully adjustable to each patient and has alternating cycle times to add or subtract pressure, optimizing comfort for the user. The unique seat cushion design has a stretched, vapor permeable, water-resistant and fire retardant coverlet. This allows the seat to stay clean and is nearly indestructible thanks its design and material. To make sure your cushion is being used properly the MobiCushion has a visual and audible operating status along with fault indicators. An advanced pressure sensor and one piece air design provides alternating pressure to fit the patients movements. The seat has a maximum weight capacity of 264 pounds and weighs no more than 2.2 pounds. Hospital protocol says that a patient prone to skin ulcers should be moved from chair to bed, or stand if he/she can, every two hours. My mom is 84, unable to stand. We move her every few hours from wheelchair to bed and back. Does anyone know if a patient can sit for extended periods of time beyond 2-3 hours? This cushion I has worked miracles. My 97-yr-old father sleeps in his recliner. Developed multiple Stage 3 pressure sores on bilateral buttocks from pressure, sheer and friction. Has the best of the best 4” high profile pressure relief cushions but this alternating pressure redistribution cushion is finally helping heal his pressure sores. ReLly, it’s the same thing as a low air loss mattress for a chair. Thank you for making this cushion available. AMA o g results.